I found this recipe in an old recipe booklet that dates back to 1994. The booklet is titled; Christmas Cookies, Old World Favorites. I did some research on Welsh Tea Cakes but this recipe seems different from the ones I found. This recipe seems more like a snickerdoodle cookie with dried fruit added, than a tea cake. Welsh tea cakes are a traditional tea-time treat that are easy to make but reminds me more of a scone or English muffin than a cookie. Snickerdoodle, pronounced [SNIHK-uhr-doo-dl] Originating in 19th-century New England, this whimsically named cookie has a characteristically crackly surface and can be either crisp or soft. The dough sometimes contains nutmeg and cinnamon as well as raisins and nuts. Traditionally, snickerdoodles are rolled in a cinnamon sugar mixture before being baked. Some say the snickerdoodle cookie is either German or Dutch in origin. The snickerdoodle has been around for a very long time. Depending on who or what you believe, the snickerdoodle hails from Germany or is Dutch in origin or perhaps got its start in New England. Some suggest that the word ‘snicker’ comes from the Dutch word ‘snekrad’ or the German word ‘schnecke’ which describes a snail-like shape. Another theory suggest that the name is from a New England tradition of whimsical cookie names. Take the Challenge! 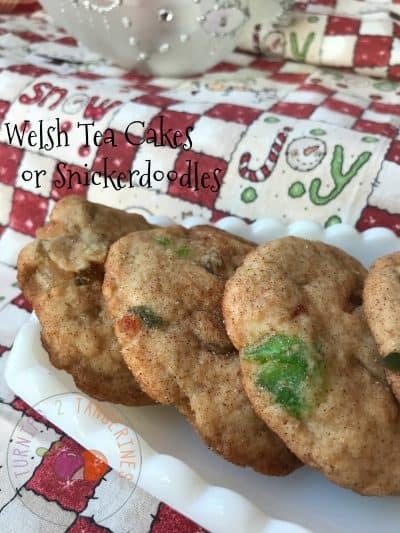 I’m going to ask you to do me a huge favor….take the Welsh Tea Cake or Snickerdoodle Cookie Challenge! 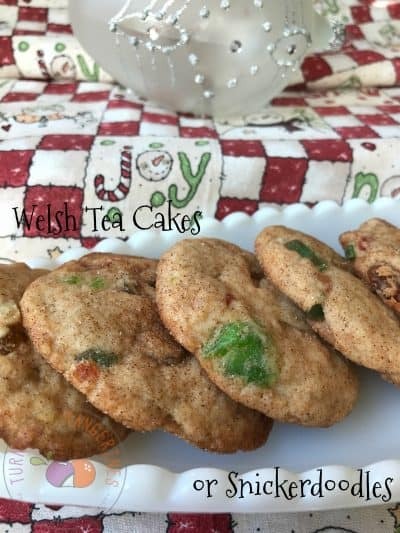 It’s really easy…all you have to do is make the recipe below for Welsh Tea Cakes, eat at least six cookies (get your family involved here) and decide if you think these tea cakes taste like a Snickerdoodle Cookie or Welsh Tea Cake. You might be thinking, how can I take a challenge if I don’t know what a tea cake tastes like? Welsh cakes are traditional in Wales. They have been popular since the late 19th century, when fat, sugar and dried fruit became popular ingredients. The cakes are also known as bakestones within Wales because they are traditionally cooked on a bakestone or a cast-iron griddle which is placed on a fire or stove. Welsh cakes are made from flour, butter/lard, currants, eggs, milk and spices. They’re round, a few inches in diameter and about half an inch thick. Welsh cakes are served hot or cold and dusted with caster sugar. Unlike scones, they are not usually eaten with an accompaniment, though they are sometimes sold ready split. They are sometimes spread with jam or butter. Huh? Now I’m even more confused! In all my years of eating cookies, and I have eaten dozens, I’ve never spread a cookie with butter…even though I’ve been known to butter a cheese danish. So, are up for the challenge?? 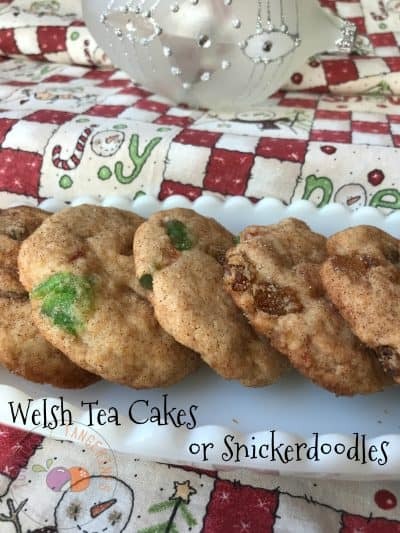 The original name is Welsh Tea Cakes but these cookies seem more like a Snickerdoodle to me. The cookies are made with Paradise Fruit. Keyword: Christmas, cookies, dried fruit, Paradise Fruit Co. Combine dried fruit and brandy in a medium bowl; let sit at least 10 minutes to plump. Place four, 1 1/2 teaspoons cinnamon, baking powder, baking soda, salt and cloves in medium bowl; stir to combine. Beat butter and 1 cup sugar in large bowl with electric mixer at medium speed until light and fluffy, scraping down side of bowl once. Beat in egg. Gradually add flour. Beat at low speed until well blended, scraping down side of bowl once. Stir in fruit with brandy with spoon. Combine remaining 1/4 cup sugar and 1 teaspoon cinnamon in small bowl. Roll heaping teaspoonfuls of dough into 1-inch balls; roll balls in cinnamon sugar mixture to coat. Place balls 2 inches apart on ungreased cookie sheets. Press balls to 1/4-inch thickness using bottom of glass dipped in granulated sugar. Bake 10-12 minutes or until lightly browned. Remove cookies with spatula to wire racks; cool completely. *For this recipe we used a combination of candied, dried fruit from Paradise Fruit Co. Candied dried red and green cherries, pineapple and lemon peel. *Took the Challenge? Let me know your answer in the comment section below:) Happy Baking!! 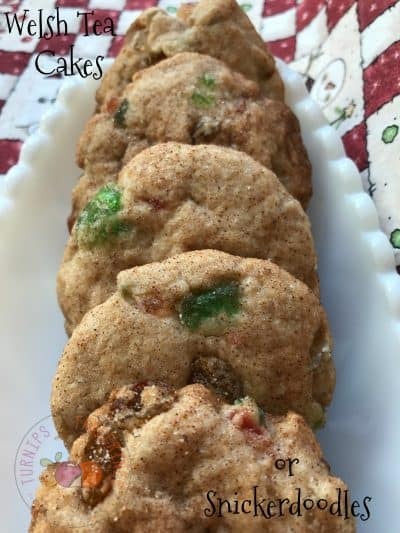 Here are more recipes using Paradise Fruit that will make you smile:)Cherry Winks, Chocolate Covered Cherry Brownie Bites and Chocolate Crinkle Cookies Holiday Style.